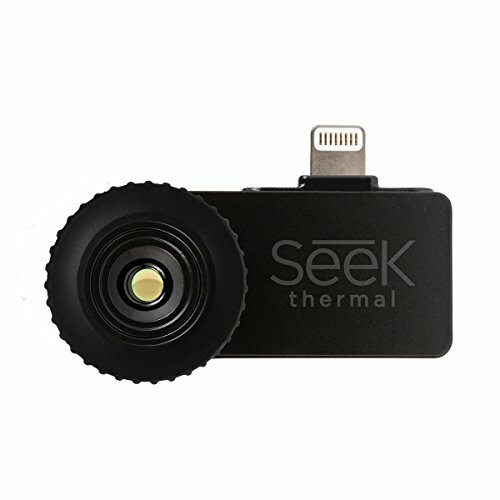 Seek Compact is a highly portable, versatile and durable thermal imaging camera that plugs directly into your smartphone. This device translates thermal energy (infrared light) into a visible image on your phone. Compact's wide, 36 degree field of view is ideal for use both indoors and close-range outdoors, allowing you to detect thermal energy up to 1000 feet away. With a detectable temperature range of -40 to 626 degrees Fahrenheit, pinpointing energy loss, spotting missing insulation, and identifying overheated circuitry are just a few of its thousands of use cases. Compact's focusable lens allows users to fine-tune their thermal imagery. It also comes with a pocket-sized, waterproof carrying case. The Seek allows you to literally see heat, making it possible to spot people and animals in daylight, total darkness, or in obscured visibility conditions. This true thermal imaging camera uses the data from over 32,000 thermal pixels to create a visible image on your smartphone. Prior to the Seek Thermal camera, this type of resolution was only available in cameras costing $3,000 and above. Compatible with iPhone 5, iPhone 5c, iPhone 5s, iPhone 6, iPhone 6+, iPod Touch 5th Generation. Will work with but not optimized for: iPad Mini (all versions), iPad Air, iPad 4th Generation.